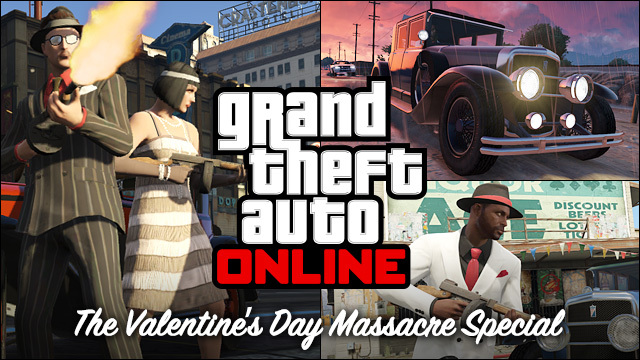 Coming this Valentines day, Rockstar will be releasing another free add-on to Grand Theft Auto V’s story and online mode. Starting this Friday, players will have access to a new wardrobe, consisting of new hats, t-shirts, suits and dresses, masks, undergarments, and a new hairstyle. To go along with the wardrobe, Rockstar has also included the Gusenburg Sweeper, a cold-steel machine gun that can be picked up for free at any Ammu-Nation. To go along with the attire and firepower, the Valentine’s Day Massacre will include the classically-inspired Albany Roosevelt. Players can either sit or ride along side the Roosevelt, firing and causing mischief. Topping it all off, the player will also be presented with 10 new jobs that range from team deathmatch to cycle racing. Be cautious though; this add-on is only for a limited time, however, once the player acquires any of the additions in the DLC, the player will have them for good.